Week 9 will feature some great match-up along with some perfect football weather. Playoff and championship hopes will have the opportunity to be cemented on Friday night, but can also lost. The slate of games sees Cloudland with the opportunity to secure a conference title, while Elizabethton and Hampton can continue to control their own destiny. For Unaka and Happy Valley, wins would be crucial for playoff chances – and seeding – as we come close to the end of the season. For the latest, be sure to like Carter County Sports on Facebook and follow on Twitter @CarterCoSports. Hancock County at Cloudland, 7p.m. Oakdale at Unaka, 7 p.m.
South Greene at Hampton, 7:30 p.m.
West Greene at Elizabethton, 7:30 p.m. Happy Valley at Gatlinburg-Pittman, 7:30 p.m. 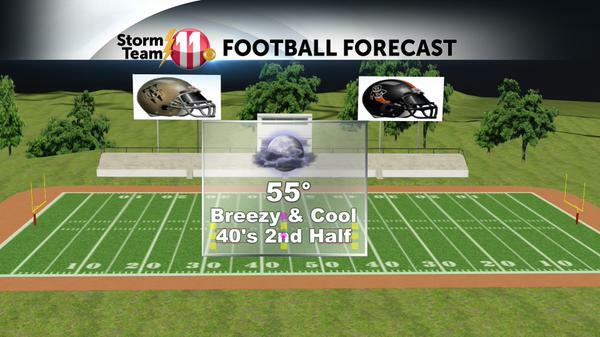 Weather courtesy of Jeremy Eiszenopf of WJHL. Follow Jeremy on Twitter @jeremyeiszenopf. Hancock County (1-1, 5-3) at Cloudland (3-0, 5-3), 7 p.m. The ‘Landers return to conference play with their eye on the first undefeated record in conference play since 2004. A win would also give Cloudland a conference championship and No. 1 seed in the playoffs. Cloudland must bounce back from a short week – after the Sullivan East game was postponed until Sunday after heavy rains soaked the field. Oakdale (1-1, 4-3) at Unaka (1-1, 1-6), 7 p.m. The Rangers are still competing for a home playoff game, and will face Oakdale in a crucial conference clash on Friday. Unaka is coming off a bye week – which was much needed. Friday night will kick off two straight conference games including the Oakdale and Hancock County games that will sort out the seeding for Region 1-A. The Rangers will need to get Micah Hunt and the offense rolling against a solid Oakdale team. South Greene (3-1, 3-4) at Hampton (4-0, 7-0), 7:30 p.m. The Bulldogs sent a message with the win over Sullivan North last week. Hampton, however, still has work to do as the Rebels come to J.C. Campbell Stadium as they will finish the season with three straight region games. Hampton will have to guard against a letdown after last week’s emotional and physical win, but should see the offense regain its’ balance after having to rely on the ground game in last week’s weather. West Greene (0-4, 2-5) at Elizabethton (4-0, 6-1), 7:30 p.m. The Cyclones are winners of six-straight games, and look to make it seven for Homecoming. Elizabethton is improving on a weekly basis – and controls their own destiny – is on a collision course for a conference championship showdown with Northview Academy in Week 11 (on a Thursday night in Elizabethton). With last week’s rout of Claiborne County, the Cyclones showed they have plenty of firepower, and look to use it again on Friday night. The Cyclones will have to try and focus on the game – Homecoming distractions is not a coach’s best friend. However, Elizabethton should have no problem taking care of business. Happy Valley (2-2, 4-3) at Gatlinburg-Pittman (3-1, 3-4), 7:30 p.m. The Warriors are coming off a solid win over North Greene, and find themselves in the middle of a three-way fight for the last two playoff spots. Happy Valley, who is a game back of the current No. 3 and No. 4 seeds, has a chance to even the score with the Highlanders on Friday night. The Warriors, who have won four of their last five, will also face South Greene in Week 11 in a showdown that could determine the last play-off spot. The Warriors will have to shake off the trip to Gatlinburg. Happy Valley will also need to see the offense continue to balance out. Top four teams in each region advance to playoffs.